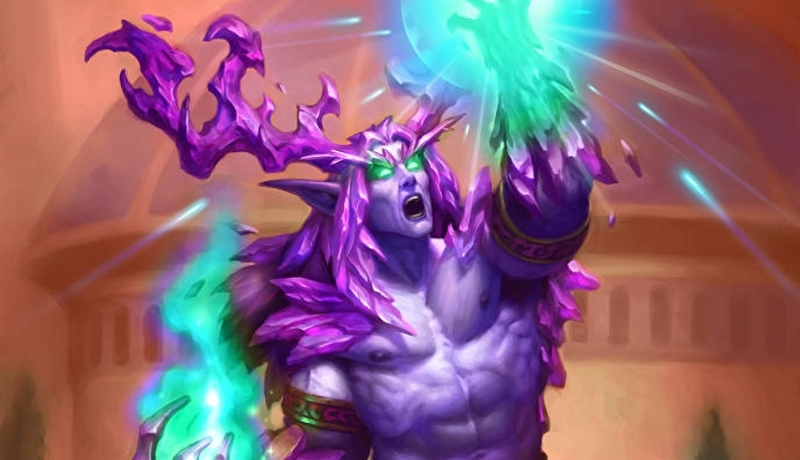 Our Heal Druid deck list guide features the best Rise of Shadows deck list for Season 61 of Hearthstone (April 2019). Our Heal Druid guide also contains Mulligan advice, card combos and strategy tips. Heal Druid is a Hearthstone deck that appears to be another of Blizzard’s big pushes for the Rise of Shadows expansion. As we’ve seen in many previous expansions, Team 5 aims to push a few specific deck archetype to players and this emphasis on healing is a new direction for Druid after some significant nerfs to the class earlier in the year. Usually, these heavily promoted deck types do not find much success in the early days of an expansion or set rotation, as they are unrefined and missing a lot of tools to get them into the top tier. Right now, the sad news is that seems to very much be the case for Heal Druid as it’s sitting at a fairly uninspiring win rate. Nevertheless, for those of you out there who are intrigued to try something new our Heal Druid guide has the most competitive version of the deck being played right now. We’ve also got some strategy advice on how you can get the most from it, as well as Mulligan tips and a list of all the important card combos. This Heal Druid deck list was theorycrafted by Alliestrasza in the days before the Rise of Shadows launch. As it will likely see further refinements over the coming weeks we will be back to update it should a more powerful version become available. We would encourage you to be cautious when using dust to craft some of its more expensive cards! The general strategy for Heal Druid is to take advantage of the multiple healing synergy cards introduced with Rise of Shadows to gain huge value over your opponents. Not only will all the added healing enable you and your minions to survive in games for longer, but also by triggering effects from your heals you can gain some incredibly powerful bonus effects. Early game:Try to control your opponent’s board as much as possible with some of the deck’s early removal cards, although don’t be afraid to take a few small hits as you have many ways to restore your Health. Wild Growth may have been nerfed but use it here to ramp up your Mana to reach your late game earlier. You can also go for some card draw effects that will set you up for the late game through Juicy Psychmelon and Predatory Instincts. Mid game:Your emphasis is on building an extremely healthy Witchwood Grizzly in the mid game. If you’ve drawn it through Predatory Instincts then it should have a lot of Health already even after some of that gets removed from the Battlecry effect. Use this robust minion to bash through your opponent’s creatures – it’s high Health value should mean you get a lot of value out of it, and you can use healing cards to keep it alive. As long as it survives you can bring out more copies with the likes of Faceless Manipulator or resurrect the ghostly bear through Witching Hour. Late game:There aren’t many late game options open to Heal Druid but the few included in this version of the deck can be huge momentum swings in your favour. Gloop Sprayer can make your board even wider by summoning an additional two copies of some adjacent minions. It works extremely well with Witchwood Grizzly. As for Lucentbark, this legendary doesn’t leave the battlefield when killed and instead goes Dormant. By restoring five Health you can start using it once again! Also, with a board established, you can use Alexstrasza to cut off a huge chunk of your opponent’s Health and find lethal damage. 1. Use your early game removal to prevent aggro from getting too far ahead in the early game. 2. You can take a little bit of chip damage here and there from their opening minions as the deck has some strong healing to top you off again. 3. Sometimes it’s worth baiting them to overextend on the board if you have a Swipe in hand as that has the potential to help clear everything. 4. Witchwood Grizzly is a nightmare for aggro to deal with, especially when you can summon multiple copies using Faceless Manipulator or Gloop Sprayer. 5. Zilliax is another wonderful tool against aggro if it looks like you’ve fallen behind in the early game. 1. With a lack of hard removal in Druid now, you’ll be relying on your multitude of minions to deal with a lot of the massive creatures in control decks. 2. With that in mind, damage dealing spells are even more of a premium for you, so try to use them wisely or gain additional copies of your ‘Choose Two’ spells through Keeper Stalladris. 3. Don’t be afraid to use your Faceless Manipulator to copy one of your opponent’s significant threats if that might help. 4. Even though the deck has a lot of healing, the chances of outlasting many control decks in a Fatigue game could be too much of a challenge, so push harder for damage at all opportunities. 5. Be careful when setting up a big board against control as you don’t want to walk right into their area of effect removal the very next turn. 1. Wild Growth: Even though it’s been nerfed you’ll still want this in your starting hand to get your Mana ramp going as soon as possible. 2. Predatory Instincts: Witchwood Grizzly is an important part of this deck so getting one into you hand – especially a buffed copy – is a huge start to your game. 3. Wrath: A useful early game removal spell. 4. Juicy Psychmelon: Can draw some of the key late game cards in the deck so you have them ready to go from Turn 7. - As Witchwood Grizzly is the only Beast in the deck you’ll always draw it when using Predatory Instincts. Doubling the Health of a minion that already has 12 at a base level is a huge buff to the card. - For exactly the same reason as above, Witching Hour will always bring back Witchwood Grizzly from the dead. Use this to keep the pressure on your opponent with the high Health creature even after they’ve killed it many times before. - Choose One cards have always provided great value, but at a cost of one mana we think Crystal Power will be a no-brainer for Healing Druid. The flexibility is obvious, the synergy with Lucentbark is immense, and its low cost makes it very easy to play alongside Keeper Stalladris. - Keeper Stalladris is a card that gives a lot more oomph to Crystal Power. If the Keeper is active, you'll not only trigger your choice of Crystal Power, but also receive a copy of each option in your hand, to be played on the same turn or a later one. - You can gets lots of added value out of your spells though Archmage Vargoth as it will repeat one you’ve cast at the end of the turn. Plan ahead as to which one you want him to use so you can get more value out of a Witching Hour or Wild Growth, for example. - With all the healing in the deck you shouldn’t have too much of a problem bringing Lucentbark back from its dormant state time after time. It represents a constant threat that your opponent has to worry about and punch through if they want to get to your life total. - Make full use of Flobbidinous Floop by playing it after some of the deck’s strongest cards. The stats aren’t too much of a concern as you’re looking at copying a particularly powerful card effect such as those on Lucentbark, Ancient of Lore, Gloop Sprayer and Faceless Manipulator. Crystal Power: A handy early game removal spell that can also function as some decent healing if you need it too. Keeper Stallaris: With all the ‘Choose One’ cards in this deck you can not worry about missing out on certain effects and save them in your hand for later. Witching Hour: Pulls a copy of Witchwood Grizzly back from the dead so your opponent has another huge Health minion they need to get through. Archmage Vargoth: The value the card represents is huge if you repeat some of your more powerful spells at the end of the turn. Flobbidinous Floop: You aren’t worried about the change in stats when playing this. Instead, you’re looking to repeat some of the more powerful abilities and Battlecry effects on offer such as Ancient of Lore and Gloop Sprayer. Juicy Psychmelon: Allows you to draw all of your important late game cards in a single spell so you aren’t left scrabbling for what to do in the endgame. Predatory Instincts: Gives your Witchwood Grizzly a substantial Health buff so that it presents a serious problem for your opponent unless they have hard removal. Faceless Manipulator: Once you get a big Witchwood Grizzly on the board you can use this to copy it and double the pressure your opponent is facing. Witchwood Grizzly: A fundamental part of Heal Druid now. You’ll be looking to buff this minion and summon multiple copies of it so your opponent will need an answer to its massive Health. Ancient of Lore: After a nerf this old favourite it returns to Heal Druid for the healing ability. Gloop Sprayer: The value you can draw out of this if placed between two copies of Witchwood Grizzly is immense. Lucentbark: With all the healing in the deck you should be able to bring it out of its dormant state time and time again to present an annoying minion for your opponent to handle. Alexstrasza: Takes a huge chunk of Health off your opponent’s life total so it is easier to finish them off in the late game.